We live on a gravenstein orchard. In our region, many apple trees have been cut down and replaced by the more lucrative grapes, but some of us still grow apples. The gravensteins have a short, early season and don’t transport well. So they lack market value, despite their perfect blend of sweet and tart. During these weeks when the apples are ready, I hustle home from court to catch them at the perfect ripeness, when they are golden-chartreuse with crimson stripes, and fall into my hand at the lightest touch. After dinner, I stir cinnamon and ground cloves into a giant pot of applesauce, sometimes so long that it reduces to smooth apple butter. I fill mason jars to gift to friends and family, sealing the jars with a simple boiling water process that has been used for two hundred years. Working in the criminal justice system can break your heart every single day. Last week my fifteen year old client was sent to the Department of Juvenile Justice, aka prison for kids. I fought this outcome for months with every hearing and motion I could. In the end, I felt I’d failed my client. I swore. I paced. I drank a bit of scotch. Then I picked tomatoes. And zucchini. And apples. I picked vegetables to grill at our annual apple harvest party this past weekend. 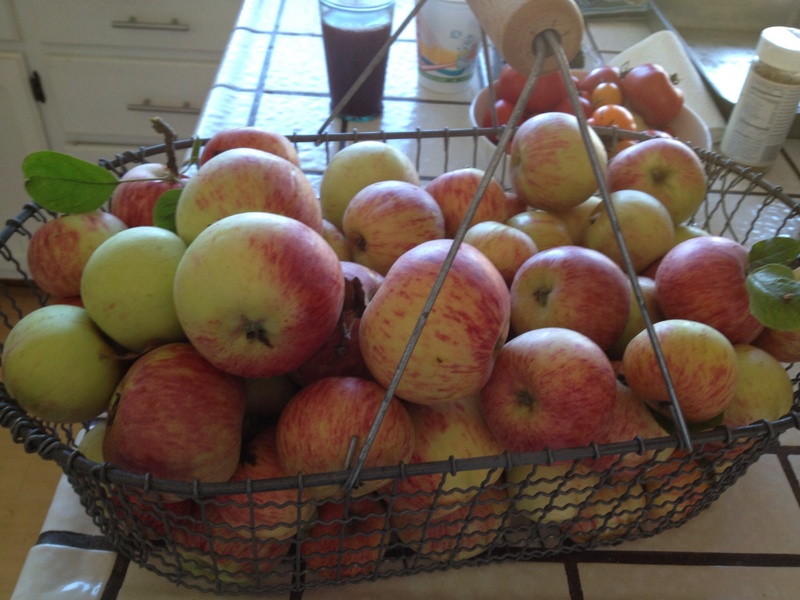 Friends streamed in with bowls of delicious food, and empty baskets to fill with apples. Kids climbed apple trees and ate apple crisp. The band played and we drank hard cider. I watched my dad and my daughter kneel in the garden and dig up a giant pile of potatoes to grill, with fish caught by friends and chickens raised by neighbors. This connection to a small agricultural community fuels my optimism, even for the broken, heart-wrenching criminal justice system. In a small community, we rely on each other, we take care of each other, we value each person. Though I have always believed it, I find it easier to argue that it is flat out wrong to throw a person away, even for a terrible act. Some of my clients participate in a restorative justice program, during which they seek to repair damage they’ve caused and ask the community to welcome them back. Despite mean-spirited and unforgiving societal trends, many are given a second chance. I hold out hope that my fifteen year old client will find his way back to earn a second chance in our community. When I started as a PD, I went to a high volume urban office in search of interesting, abundant cases. Fast pace, action, front lines. My counterbalance to tough days as a young PD in the Oakland trenches was riding a motorcycle and staying out too late at dive bars. Now my counterbalance is plunging my hands into the warm dirt in the garden. Life in the country gives me a new perspective about my place in the struggle for big goals like fairness and justice. Sometimes they still seem lost, unattainable. Other times, I see that they are always there, inevitable and right, emerging bit by bit against all odds, like a root crawling along a crack in the pavement. We prune them and stake them and tend them, but our apple trees have a life of their own. The gravensteins in our orchard grew through the civil rights movement, through the punitive trend of mandatory minimums, and into the current movement to reduce over incarceration. They grew in the El Niño rains we had several years ago, and in the drought this year. Since I’m new to this farming thing, I was foolish enough to ask, because of the severe drought, “will any apples grow this year?” In fact, the drought has made the apples sweeter.